A pulse of cooler water at its edge let part of the glacier gain some mass. But overall, the melting across Greenland continues apace. IT’S MELTING AND it’s not coming back. That’s something we often hear about our shifting climate and the ice that, in a sense, holds it together. Throughout the Arctic, glaciers are shrinking, right? Maybe not quite the way we think. 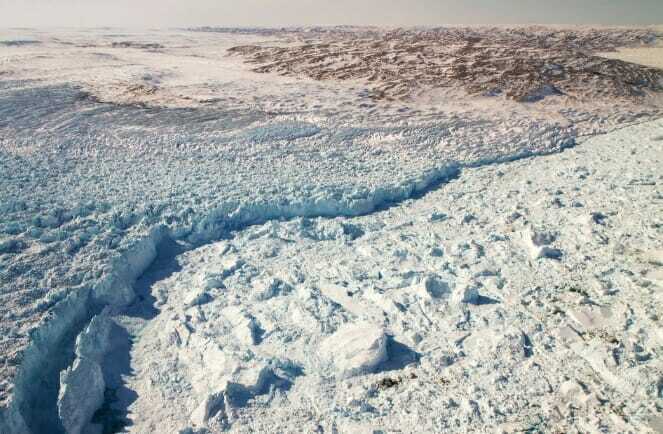 NASA’s Oceans Melting Greenland (OMG) project has revealed Greenland’s Jakobshavn Glacier, the island’s biggest, is actually growing, at least at its edge. In research published Monday in Nature Geoscience, researchers report that since 2016, Jakobshavn’s ice has thickened slightly, thanks to relatively cool ocean waters at its base—which have caused the glacier to slow down its melt. This reverses the glacier’s 20-year trend of thinning and retreating. But because of what else is happening on the ice sheet, and the overall climate outlook, that’s not necessarily a good thing for global sea level. That’s because, despite the fact that this particular glacier is growing, the whole Greenland ice sheet is still losing lots and lots of ice. Jakobshavn drains only about seven percent of the entire ice sheet, so even if it were growing robustly, mass loss from the rest of the ice sheet would outweigh its slight expansion. Adam Popescu – National Geographic – March 25, 2019.